WASHINGTON (CNN) -- Sen. Jim Webb will meet with Myanmar's prime minister Monday on the sidelines of the United Nations General Assembly in New York City, the Virginia Democrat's office announced. 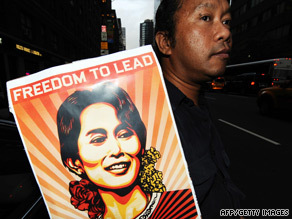 A Myanmar pro-democracy supporter displays a poster outside the United Nations in New York. "I look forward to continuing the dialogue with Prime Minister Thein Sein that was begun last month," said Webb, according to a statement from his office. Gen. Thein Sein is the highest official from Myanmar, also known as Burma, to attend the U.N. annual gathering in 14 years, the statement said. He addressed the assembly Monday morning, in which he spoke about working with other countries to alleviate the impact of the global economic crisis on his country. He also took the opportunity to reject economic sanctions, which have been the heart of U.S. policy toward the military-led country. "Some powerful nations have been resorting to economic sanctions to pressure developing countries," Thein Sein said. "Their aim is to influence the political economic system of those countries without taking into account the historical and cultural backgrounds. "Sanctions have no moral basis as they not only hinder the economic and social development of the people, but also interfere in matters which are essentially within the domestic jurisdiction of the country." United Nations Secretary-General Ban Ki-moon also met Monday with Thein Sein, according to a U.N. statement. Last month, Webb became the first American official to meet with Myanmar's junta leader, Senior Gen. Than Shwe, when Webb went to Myanmar to secure the release of American John Yettaw. Yettaw was sentenced to seven years of hard labor after swimming to the home of pro-democracy leader Aung San Suu Kyi in Yangon where she has been under house arrest for 14 of the past 20 years. Webb, who chairs the East Asia and Pacific affairs subcommittee of the Senate Foreign Relations Committee, also met with Suu Kyi during that trip. According to the U.N. statement, in his meeting with Thein Sein on Monday, Ban "reiterated his clear expectation that Myanmar will respond in a timely manner to the proposals he left with the senior leadership of Myanmar during his visit. In particular, the Secretary-General made clear that the onus was on the government to create the necessary conditions for credible and inclusive elections, including the release of Daw Aung San Suu Kyi and all political prisoners, as well as dialogue with all stakeholders." Monday's meeting between Webb and the Myanmar prime minister comes at a time when the United States is shifting its policy with the Southeast Asian nation. Last week, Secretary of State Hillary Clinton announced that the United States will try to directly engage with Myanmar's military leaders without abandoning its existing sanctions. Suu Kyi issued a statement saying she accepted that policy and would be open to working with the junta in order to get economic sanctions against the country lifted. Previously, Suu Kyi has staunchly opposed lifting any sanctions against the current regime in Myanmar. Clinton said her announcement was part of a policy review announced in February, which was slowed down in May when Suu Kyi was placed under house arrest again after the Yettaw incident, according to a senior State Department official who talked to reporters on condition that he was not named. He added that Washington would only consider lifting sanctions "if Burma made progress toward addressing our concerns on the core political issues." "But at this point, they haven't made any such progress," the official said. Myanmar's military junta, which has ruled the country since 1962, changed the English translation of the country's name from Burma in 1989, but Suu Kyi's supporters and several governments still use the older name.